Style fixed ... most of it ... I have to fix upload screen. EDIT: i have tested yes it’s better, like link list menu where the fa icons are nice. Maybe you can use the same eye fa icon in the navbar. 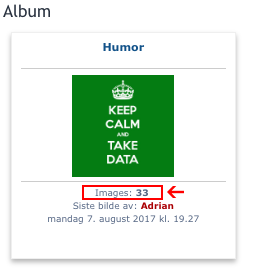 in UCP, the album subscriptions page (./ucp.php?i=-phpbbgallery-core-ucp-main_module&mode=manage_subscriptions) has 3 columns but for images which has received some comments the comment link isn’t displayed and the text “by …” isn’t displayed at the correct location. Futhermore, why i can’t note my own photos, while the permissions are correct? By doing some screenshots, i had set my user settings to english and prosilver to show you the problems with original conditions like a vanilla phpBB, and i discovered a new problem with language! by inverting language in two previous tests (english to french and french to english) it’s the same situation, same issue. Very strange issue. I have tested on phpBB 3.2.0 and 3.2.1 original versions with prosilver. The phpBB Gallery CORE extension is the problem not addons. Yes, i wanted to test the rating for my own photos but i can’t. I can rate the photos from other users but not mine while the permissions are set correctly. Maybe it’s stupid to rate my own photos but why to propose the permission for rating if i can’t? Language. The loading of language is handled by phpbb language class. I don't know why it loads the wrong one. About rating - it is hard coded that the user can't rate his own images. Thank you for the style adjustment. Sorry, the user's signature, under the comment, is not displayed correctly. archivar wrote: Thank you for the style adjustment. The user profiles have to be rewritten. The signature is not accepted by the gallery in the BBCODE. PhpBB recommends using php 7.1. The gallery can not run on such system, the server stops and nothing is displayed, everything does not work. You have to remove everything manually - giant work. Grenh wrote: PhpBB recommends using php 7.1. The gallery can not run on such system, the server stops and nothing is displayed, everything does not work. I think I'm working on 7.1 but I will check tomorrow on my dev machine ... if not I will update and push a fix. If you cannot reproduce try to test with my thumbnails configuration above. You’ll agree that it’s problematic. Maybe it’s because my thumbnails size is over the default size, but the script should consider of different thumbnail sizes. Try to test with my thumbnails configuration above. Please, by not resolving this issue user can’t use correctly your tool on a multi-languages board. Ask to the phpBB Extension Team. Satanasov wrote: About rating - it is hard coded that the user can't rate his own images. phpBB Gallery doesn’t take in consideration BBCode and Smilies in signature displayed on comment pages. @Satanasov, take a look at: viewtopic.php?p=14801546#p14801546. It’s about number 4 from my post, here: https://www.phpbb.com/customise/db/exte ... 51#p579651 (language issue). If you have some informations to help DavidIQ you’re welcome.